The video voiceover spends a bunch of time talking about my issues (YouTube is cheaper than therapy, right?) – but basically, I colored a ton of images from the brand new Wplus9 sets Going Places and Wishing You on Neenah cardstock. Then I stamped the balloons on a 12×12 piece of white cardstock (you can use almost any white paper when airbrushing), used a Copic airbrush, as well as Copic refills and colorless blender on fabrics for the bottom section. Next I pieced the colored images on top using dimensional adhesives. Check out the video below, or click HERE to watch in HD on YouTube. For the journalling on this page, I started by writing “Your rocks are not my rocks” over and over in black pen in the dark area at the bottom. Just to remind myself that I am not to pick up the words others cast at me! ;0) Those words deliberately disappear into the rocky hills, leaving the emphasis on the white words on the hillsides. That section, which is blurred out because it gets a bit personal, is all about who I am in God’s eyes. Affirmations of Who I belong to. And Whose opinion matters! And recommitting myself to trust in what He says, and dropping the rocks and monkeypoop others hurl my way. It felt good just writing all that out, even though the white pen on the light green hills isn’t terribly readable; the act of writing it was a prayer and a release. 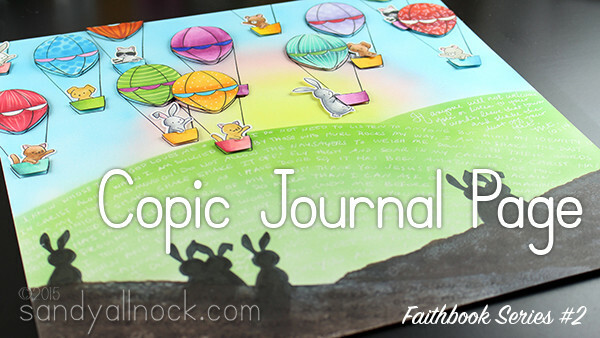 I hope you’re being inspired to do some art journalling about your faith; I talked with a number of women about it this past week in California – and many of us have wanted to do this for a long time. We need to just get started, right? You are an inspiration to all of us! Please realize that there are always others out there who would like to make others feel badly. Shame on them, you are an artist and so many of us appreciate you and your work. Deep breath and blow them off! I’m know easier said then done, but do it!!!!! God has bless you so much and thank you for being a blessing to so many I Love your art!!! I so well know what you mean..I am that bunny holding on to the basket too..
so your video made me get tears in my eyes..and my heart goes out to you…knowing how you felt.. 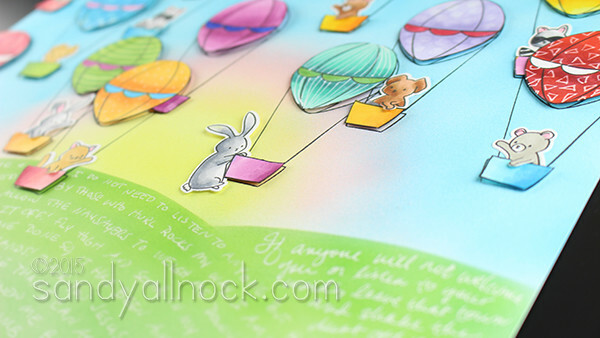 I love your art journaling..and I am sure the bunnies didn’t mind..they are all up in those balloons now too…. Very nice layout! It seemed like the stamp set was made just for what you did!! Thanks so much for sharing your experience.